On hand to officiate the ceremony and serve as Chief Consecrators were The Most Rev. Dr. Foley Beach, Archbishop and Primate of the Anglican Church in North America, The Rt. Rev. Bill Murdoch, First Bishop of the ADNE, The Rt. Rev. James Hobby, Bishop of Pittsburgh. 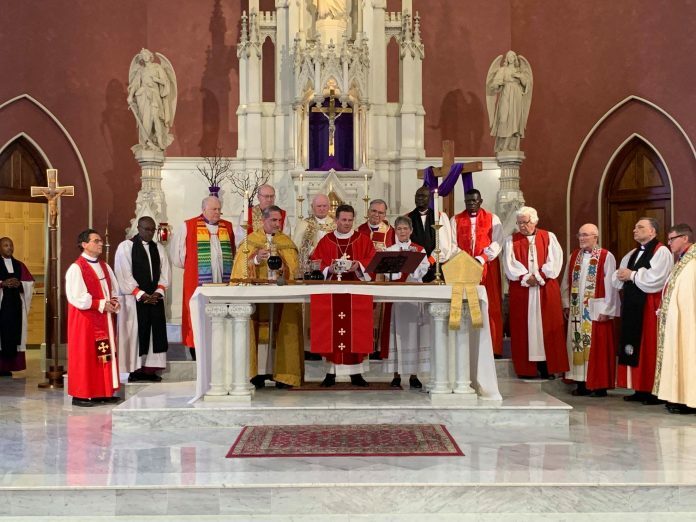 Ten other ACNA bishops came from around the country, as well as Bishops James Ssebbala and Cranmer Mugisha of Uganda and Bishop Adam Andudu of South Sudan. The Rt. Rev. Bill Atwood, Bishop of the International Diocese of the Anglican Church in North America, delivered the sermon on the history of the province, its implications for the worldwide Church and for the local church, and the significance of the role that Bishop Williams will assume on behalf of New England and the Anglican Church in North America. Over 600 guests were present for the celebration of this historical event as they welcomed Bishop Williams, who will continue on Bishop Murdoch’s legacy in the missionary diocese of New England. The event was held a block down the street from All Saints Anglican Cathedral at Holy Family Parish, a Roman Catholic church, with the blessing of Cardinal Sean O’Malley, Roman Catholic Archbishop of Boston. A solemn procession began at the Cathedral, led by a bagpiper, and ended at Holy Family for the start of the ceremony. The service is a reminder of the ongoing ecumenical partnership between the ADNE and the Roman Catholic Archdiocese of Boston, which has supported the ADNE in various ways since its inception. A luncheon for all the guests was held on the All Saints Cathedral property.